HOUSTON — Kroger Co. on Wednesday began offering grocery delivery service with autonomous vehicles in Houston. The service, offered in partnership with Nuro, is being offered from the retailer’s South Post Oak store, and will be available from its Buffalo Speedway store later this spring. Houston is the second market for Kroger and Nuro’s delivery service, and the first public use of Nuro’s self-driving fleet in the city. The service represents a new type of delivery service option for Houston residents, according to the companies. As with the first pilot market in Scottsdale, Ariz., Kroger and Nuro are starting the service with Nuro’s manual and self-driving Toyota Prius fleet, and will introduce the next generation of Nuro’s custom driverless vehicle later this year. 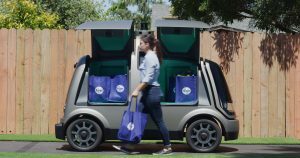 What: Grocery orders can be scheduled for same-day or next-day delivery by Nuro’s fleet of manual and self-driving vehicles.